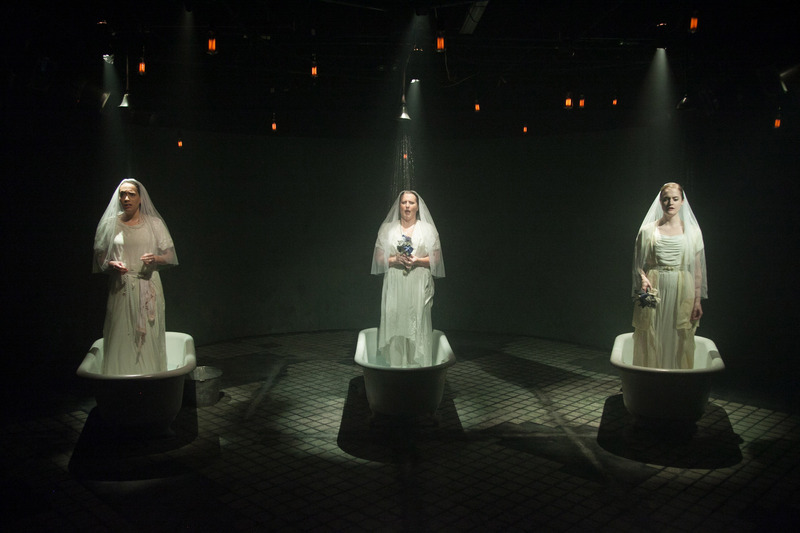 Review “The Drowning Girls” (Signal Ensemble Theatre): Theatrical Collaboration at its Finest! Signal Ensemble Theatre presents the Chicago Premiere of THE DROWNING GIRLS. There is nothing amusing about domestic violence. And when the abuse ends in a murder, it can only generate overwhelming sadness for the victim. The true story of three newlywed brides being killed is horrific to imagine. Despair is the inevitable takeaway from a play showcasing such cruelty. And that’s what makes this show such a pleasant surprise. THE DROWNING GIRLS tell this gripping, nightmare-of a tale giggling and splashing. The ladies drench themselves in a shared truth and big buckets of water. When the audience enters the theatre, it’s uncomfortable. Set Designer Buck Blue has placed three claw-foot tubs on his stark stage. And director Melanie Keller has placed a body in each. The stage floor is tiled in a familiar white-black bathroom pattern. Lights dangle on wires from the ceiling. Sound Designer Anthony Ingram adds his hollow, singular drip soundtrack. It cuts through the quiet as a haunting reminder of the watery graves. Lighting Designer Michael C. Smith bathes the room in shadows. We’re in an intimate space… a bathroom. But it has the sterility of a morgue and the sinisterness of an alley. Death is in the room. And the creep vibe is off the charts. The show starts with Katherine Schwartz (Bessie) awaking. With a full body shudder and gasping for air, Schwartz jerks herself alive. It has the cinematic quality of a person waking up from a nightmare or to a vampire existence. It’s disturbing and disconcerting especially because I know it’s going to happen two more times. Meghan Reardon (Alice) is the next resurrection. She does the same ritual as Schwartz. Each gal comes to consciousness and immediately does inventory to assess the situation. There is a I’m-in-a-tub-and-I’m-dead-realization. And here’s where the whimsy comes in. Schwartz and Reardon see each other’s similar dire predicament and they giggle… like schoolgirls. And then, they proceed to playfully splash water across the stage at each other. They even kick it up with short synchronized swim moves. The initial tone has shifted. These ghouls are gals. And they want to tell their story in a spirited way. Playwrights Beth Graham, Charlie Tomlinson and Daniella Vlaskalic penned the tale of George Joseph Smith, a bigamist and serial killer. In the early 1900s, Smith preyed on the innocence and loneliness of English women. Graham, Tomlinson, and Vlaskalic tell Smith’s stories through the memories of the ladies who fatally loved him. The storytelling is lyrical as Schwartz, Reardon and Anne Sheridan Smith (Margaret) describe the desperation and aspirations of SWF ISO A MAN… any man. The societal limitations of the time period are chatted over tea in one of the tubs. Its wondrous how, despite the circumstances for the get together, the mood remains lighthearted. As the ladies discuss proper society, the tea pot pours water into their cups which are bottomless. The water spills all over their laps. Water plays a huge role in this show. For the duration, the ladies are soaked to the skin repeatedly. Rachel Lambert (Costume Designer) has them emerge from their tubs in old-fashioned underwear. At some point, they get out and don various frilly dresses. Although I’m relieved that they get to dry off and cuddle up in Lambert’s vintage finery, I realize quickly their fate is drowning. The ladies effortlessly climb in and out of tubs. They get showered on. They chase each other on the wet tiles. They are constantly soaking wet. At one point, they pull nylons out of the water and put them on. 50% of the population know how excruciatingly frustrating and uncomfortable that feat is. This show is so engaging as a watery spectacle it’s easy to get distracted. Even if the faucet was turned off, this superb ensemble would still captivate. Under Keller’s masterful direction, their storytelling engages. They intertwine looming spinsterhood, bridal giddiness, and afterlife resignation into a beautiful shared sisterhood. Schwartz, Reardon and Sheridan Smith each play a variety of characters with distinction. And nod out to Dialect Coach Elise Kauzlaric for using accent variations to identify the different characters. THE DROWNING GIRLS is a unique experience. This is theatrical collaboration at its finest. The actors, writers, director, designers create an imaginative and evocative memory. The show is unforgettable.